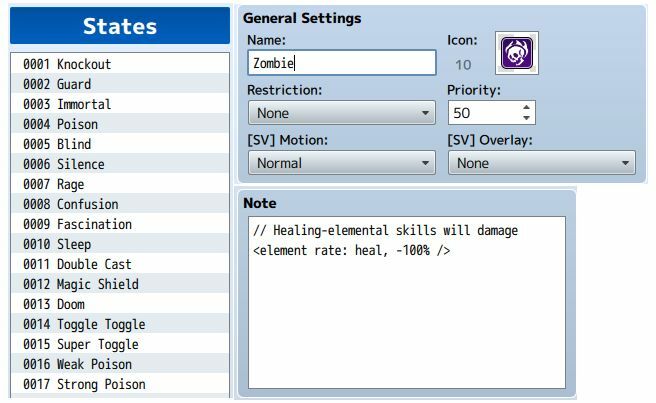 Element rates determine the multiplier effect on skill or item damage. For example, if you have 200% element rate towards fire, any fire damage inflicted against you will be 200% effective, or double the damage. Similarly, if you have 0% element rate towards fire, any fire damage inflifcted to you will be 0% effective, or result in no damage. absorb half of the damage. This plugin allows you to specify negative element rates. Download ths plugin and place it in the “plugins” folder in your project’s “js” folder. Then open your Plugin Manager (F10), double-click an empty row, and select the HIME_ElementalNegation plugin. Where the ELEMENT_TYPE is either the name or the ID of the element, and the RATE is a number. 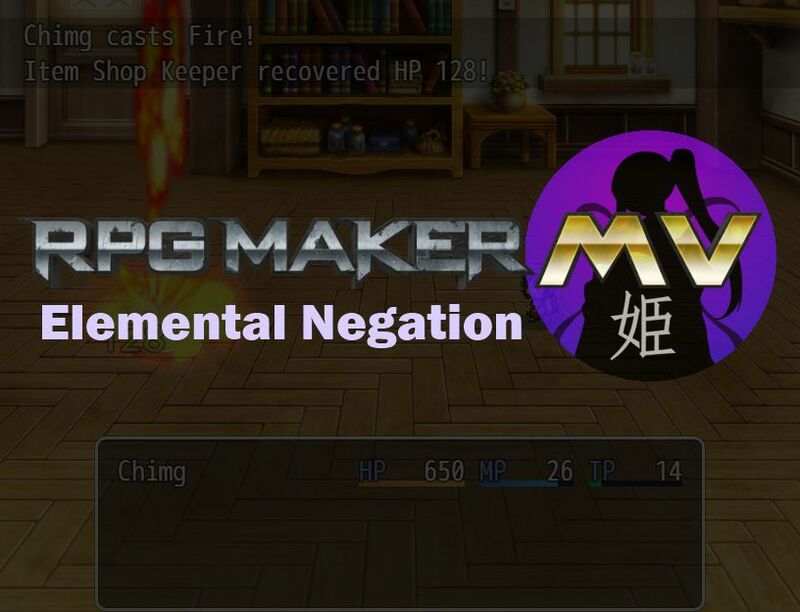 This plugin no longer works after the most recent RPG Maker MV update (same with every other plugin that allows for elemental absorption). Any chance it could be fixed to be compatible with the new version of the engine? Because this plugin gives me one of the core features of the game I’m working on, and so far, I like this one best out of all the elemental absorption plugins I’ve seen. And had an enemy use a fire spell on the actor, and the actor absorbed it. How are you testing it? Perhaps there is a different case that isn't working. And the slimes in the first few maps with enemies all have water element normal attacks, which up until a day or two ago, would be absorbed by the actor just fine. But starting the day of the update, within an hour of that exact time, it just stopped working and the actor took damage as if the attack had no element. Which is particularly strange because I hadn’t actually updated my project files to the new version yet. But over on RPGMakerweb, someone else was able to replicate this problem with the updated version, and I have since updated and done so as well. Worth noting is that all of the times I have confirmed that the plugin isn’t working have been during playtests. I don’t know for sure if it behaves differently if one plays a deployed game of it, but I have reason to believe it doesn’t work then either based on some comments by one of my game’s beta players. In summation, I’m not entirely sure whether it has anything to do with the update or not in my case, but I do know that it stopped working the same day. And unfortunately, that’s the only major factor that actually changed around the time it stopped working, so I don’t even know what else to be looking for. Okay, so it’s not letting me copy-paste the note tags. Basically I have the main character set up with a -50% element rate for six different elements. I cropped it to show just the note box. Is there anything else I should screenshot while I’m at it? I hear you can bring up a debug log for a playtest with a certain F# key, but I don’t remember which. it doesn’t work I have an element name with icons, but with number or ID it still work. Weird? What do you mean by “icons”? Lol yes, copy-paste but forgot to edit name. That has been fixed.